Selling and applying vinyl wraps is not a core dealership business because of the complex and tricky nature of applying the product, but it’s a profit centre that shouldn’t be over-looked. “It doesn’t make sense to bring this in-house,” says Jeff Uzbalis of 3M Commercial Graphics (Canada). Skilled installers take years to hone their craft. All dealerships have to do is partner up. Like other suppliers, 3M has an accreditation pro-gram for shops and installers to help consumers and auto-industry players sort the wheat from the chaff. Auto Trim Design and Signs of London, Ont., is accredited by 3M as a graphic provider, installer and warranty provider. Owner-operator David Kompelien says his shop has relationships with many London-area dealerships that in most cases were initiated at their request to wrap shuttle and service vehicles, parts and loaner cars, and to complete signage projects. 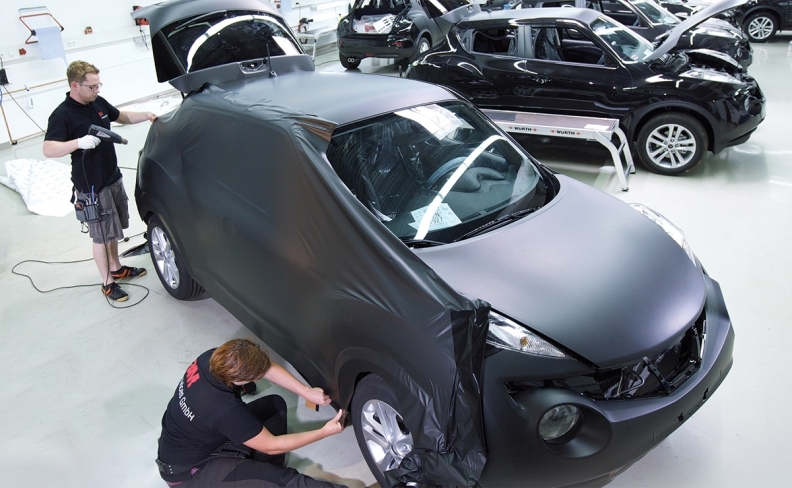 Many dealerships refer customers to their preferred wrap suppliers; others sub-contract it out and roll the paint protection or wrap into the sales deal. One dealership that does the latter, and has taken the paint-protection-product offering to a new level is Grand Touring Automobiles (GTA), purveyors of many high-end brands at its locations in Toronto and Maple, Ont. The Maple location sells and services Lamborghini and Aston Martin vehicles, and, says general sales manager James Davidson, “100 per cent” of its new-vehicle buyers get the pitch on paint protection film (PPF). The film, usually referred to as stone guard, doesn’t come cheap at GTA. Prices start at $2,500 for the front clip, and to totally PPF wrap a new Lamborghini Aventador will set a customer back about $10,000. GTA contracts top-notch installers who wrap vehicles in the store’s service department. Davidson says the installers need hoists to properly wrap the nether regions of the vehicles, using multiple pieces of film that are laser cut to exactly match the vehicle’s body parts. AutoTrim’s Kompelien adds that when it comes to more mainstream vehicles, PPF on the hood and fenders can be installed for as little as $250-350, and is becoming more popular with leased vehicles, so lessees aren’t faced with stone-chip repairs at lease end. Because most Lamborghini and Aston Martin vehicles are ordered, Davidson says GTA has the luxury of broaching the subject of PPF several weeks before the vehicles arrive; it’s definitely not a last-minute sales pitch in the business office. Uzbalis of 3M adds that dealers with commercial accounts needing commercial wraps should discuss the products with those customers well before the F&I office. “Dealers should be talking to these guys upfront and saying, ‘we’ll give you a professional wrap package to advertise your business’.